NetGear, a networking products provider, has introduced the Digital Entertainer HD (EVA8000), a wireless networking router designed to bring the digital media to television sets. NetGear made its introduction a week before MacWorld Expo, where Apple is expected to introduce its own wireless media router, the “iTV”. 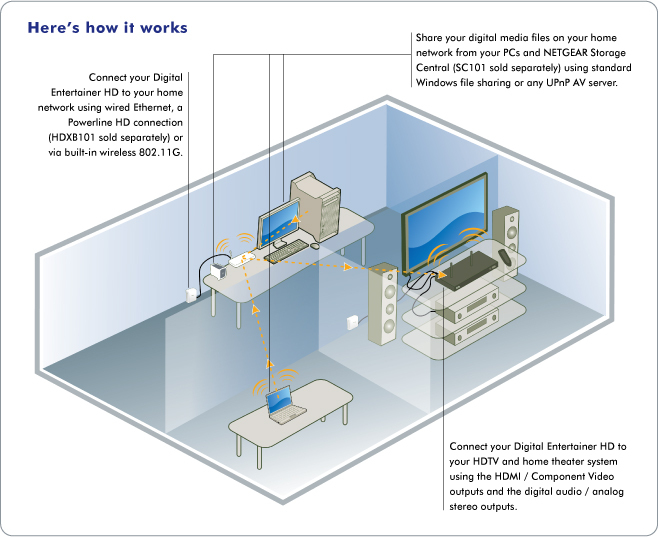 NetGear’s digital media receiver offers lets high-definition televisions display media files and Internet content streamed from Windows as well as Mac computers, network storage devices and USB media devices. As Internet media such as podcasts, video podcasts and streaming video grow in popularity, some expect devices such as NetGear’s Digital Entertainer and Apple’s iTV to become an important new category of product because of people’s desire to watch video on large televisions. The Digital Entertainer HD discovers HD movies, TV shows, music files, and personal photos on a home network, across multiple PCs, and organizes these into a single media library that can be displayed on a TV without the need for media server software running on the computer. Using the included remote, users can search their media library by multiple criteria including title, actor, date, genre or thumbnail images (from photos, album art or DVD covers). A High-Definition Multimedia Interface (HDMI) port displays video resolution up to 1080p on big-screen TVs and optical digital audio output (TOSLINK) transmits full digital surround sound to the consumers‚Äô digital audio receiver. As devices like the Digital Entertainer HD become available, they promise to reignite the debate over where people will get HDTV content from. The Digital Entertainer HD includes an on-screen TV wizard and PC installation software for simple setup. With the included Windows PC software, the Digital Entertainer HD enables users to listen to music from iTunes, view YouTube videos and access their PC desktop from their living room. When the PC has an optional TV tuner installed, consumers can schedule recordings and pause or rewind live broadcasts using the Digital Entertainer HD without the need for an additional DVR device. Multiple Digital Entertainer HD receivers can work in concert throughout a house. Using ‚ÄúFollow Me,‚Äù consumers can pause a video in one room and resume it in another. While in ‚ÄúParty Mode,‚Äù they can synchronize music playback for whole-home listening. They can also plug in their USB flash drives, iPods, or other USB storage devices directly into a Digital Entertainer HD to instantly access and play high-resolution digital media. Users connect the Digital Entertainer HD to their home entertainment system and to a router. The Digital Entertainer HD can stream many unprotected file formats over a home network from Macs, Linux computers, the NetGear Storage Central, USB storage devices such as flash drives and the iPod, and can support Universal Plug and Play (UPnP) media servers. The Digital Entertainer HD also supports access to created, downloaded and purchased content on standard Windows XP and Vista PCs through Windows Media Connect. The Digital Entertainer HD also plays internet radio directly and can access RSS news feeds and local and national NOAA Weather and maps. The Digital Entertainer HD includes one HDMI port for digital AV connection, RCA connectors for composite and component video outputs, stereo RCA audio ports, coaxial and optical digital audio outputs, an S-video port, and a SCART connector for regions requiring it. The digital media receiver decodes many leading audio formats (MP3, WAV, WMA, FLAC, M4A, AAC, AC3), purchased music from iTunes on Windows (M4P), video formats (MPEG1/2/4, WMV, XviD, H.264) and image formats (JPEG, BMP, PNG, TIFF). It integrates a 10/100Base-T Ethernet controller, support for 802.11g wireless networking, and two USB 2.0 ports (front and rear) for additional connectivity with flash memory, iPods or other portable music and video players. It supports multiple interoperability standards, including Universal Plug-and-Play (UPnP AV), Digital Living Network Alliance (DLNA) and emerging digital rights management technologies such as Microsoft Windows Media DRM 10 for Network Devices. It supports several security standards including WEP, WPA-PSK and WPA2-PSK. The Digital Entertainer HD (EVA8000) is expected to be available in the first quarter of 2007 through online e-commerce sites, and select retail sites and value-added resellers. The device will have a one-year warranty, 24/7 technical support and a MSRP of $349.